Farmland birds are at their lowest levels since records began, according to government figures. 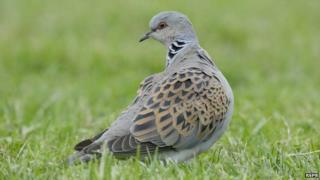 Numbers of birds such as grey partridge, turtle dove and the starling are down more than 85% since 1970s. But there has been an increase in some other bird species, including seabirds. The figures come from an assessment of wild bird populations in England, which has been compiled by the Department for Environment and covers 118 different bird species. It includes data on 19 species reliant on the farmed countryside. Over the last 40 years, indicators used in the report show a decline in farmland birds of 56%, with turtle doves declining the most rapidly - down 96% since 1970. Other species under pressure include skylarks - down 62% since 1970 - and lapwings which are down by 50%. Much of this decline is blamed on the rapid change in farmland management in the late 1970s and early 1990s. Modern intensive farming methods means that fields have become much bigger, and more chemicals are used. With a significant loss of hedgerows, birds have fewer places to nest. Media captionOver the last 40 years, indicators used in the report show a decline in farmland birds of 56%, with turtle doves declining the most rapidly - down 96% since 1970. But some species are doing well. Wood pigeon numbers are up by 150% since 1970, and jackdaw numbers have increased by 130%. Tracy Adams is an independent farmland bird adviser. She said: "It's a very complex picture. Changes in farming have been driven by government policy since the war. "Lots of grassland was ploughed up and a lot of money was put in to developing artificial fertilizers and sprays. This has led to a reduction in insects. "But things are definitely improving, and lots of farmers are doing a lot to increase the amount of habitat for the birds to breed and find enough food to survive." "Birds that migrate, such as the cuckoo and turtle dove, are suffering from increased amounts of trapping for food consumption," said Tracy Adams. "They are being shot as they fly here from Africa, and their wintering grounds are increased by the intensification of farming there." The Royal Society for the Protection of Birds (RSPB) is urging the government to "make the most of the budget for wildlife-friendly farming". The UK government has a commitment to reverse the long-term decline in farmland bird numbers. Defra will soon be outlining a New Environmental Land Management Scheme (Nelms) which will replace the current model of environmental stewardship. Many conservation and farming groups are questioning whether these changes will do much to improve the protection of the environment.